“Meenakshi Gurukkal crouched low, sword poised; her eyes unblinking as she faced her opponent in the mud-paved ‘kalari’ or arena. From the tree tops, a mynah’s call resonated in the silence. In a flash she moved to attack, twirling her sword; metal clashing loudly as it made contact with a shield. 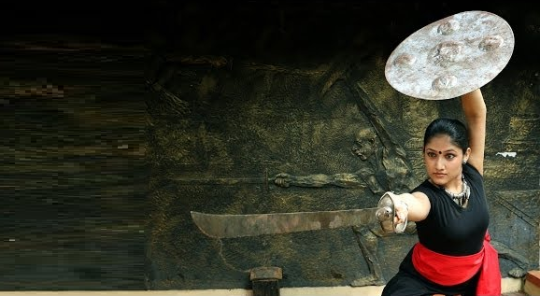 At 74, she is possibly the oldest woman exponent of Kalaripayattu, the ancient martial arts from Kerala. She has been practising Kalaripayattu for no less than sixty-eight years – training and teaching. Another awesome example of warrior women from the real world, reading through the article confirms that this martial art was traditionally practiced across genders until it was suppressed by colonialism. Oral folklore in north Kerala, known as Vadakkan Pattu or Northern Ballads, is rich with tales of Kalaripayattu champions. Among them are the Thiyya/Ezhava warriors of Puthooram tharavad in North Malabar- heroes and heroines such as Aromal Chekavar, an expert in ‘ankam’ (duelling) and Unniarcha, a women skilled in ‘urumi’ combat who singlehandedly took on vagabonds to ensure safe passage for women in that area. Women have always fought. Just not in bikini armor. Gallery | This entry was posted in Uncategorized and tagged women's weapons. Bookmark the permalink.